The "Biggar" Prop House in Atlanta! Looking for just the right movie props in Atlanta for your prodution? Whether you're looking for something last minute, or you're planning out your production, Biggar's Prop House can help you get just the props you need. We've been in the prop business for the last 40 years, having our props in movies like: Driving Miss Daisy, the TV series Ozark, Spiderman, Pitch Perfect 3, just to name a few of the many productions we've served. No matter what the prop, we can help. We also have a prop finding service, so if there's something specific that you need for your movie, television, or stage production, we can help you get exatly what you need. What's shown on our website only represents a VERY small portion of the props we carry. There are so very many, putting the inventory online would take years. Our prop warehouse is huge, and having been in the prop business for the past 4 decades, we've collected a prop or two! It's true-- we have more props hanging from our ceilings than most prop houses in Atlanta have in their whole inventory! If there's something specific you're looking for, give us a call. We're eager to serve, and probably already have just what you're looking for! Looking for movie props in Atlanta for your television or movie production? Look no further than Biggar's Atlanta Prop House. 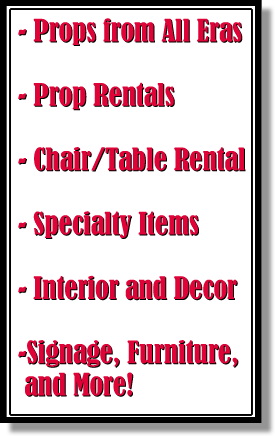 We can provide all the props you need under one roof. We've been in business for the past 40 years, and have provided props for movies like: The Apple Dumpling Gang, Driving Miss Daisy, In the Heat of the Night, The Legend of Baggar Vance, Spiderman, The Founder, Ozark, Pitch Perfect 3, and Stranger Things, just to name a few. We have props from many different time periods-- including 1800's and 1900's, and present day, so if you are in need of props from a specific time period, chances are that we have it in house and ready to use. Many of our clients regularly come to us because of our ability to provide hard to find items and specialty items. From eccentric to eccletic, old to modern, we've got it in house and can be your one stop shop for all movie and television props in Atlanta. If we don't have a specific item in hand, let us know and we'll try to track it down for you. We're pleasant people, easy to work with, and because we have done this for so very long-- there's not much we can't come up with for your production. When you visit, you'll see the vast warehouse space we occupy, filled floor to ceiling wtih props and antiques that are camera and production ready.